Rhodes is a suburb of Sydney, in the state of New South Wales, Australia. Rhodes is located 16 kilometres west of the Sydney central business district, in the local government area of the City of Canada Bay. It was formerly part of Concord Municipality until a merger with Drummoyne Council to form Canada Bay in December 2000. Rhodes sits on a peninsula between Bray Bay and Homebush Bay, on the southern bank of the Parramatta River and is located about 3 kilometres from Stadium Australia, Sydney Olympic Park, Sydney International Aquatic Centre, Bicentennial Park and Millennium Parklands. The pedestrian, cyclist, transport and emergency services Bennelong Bridge from Rhodes to Wentworth Point opened in May 2016. The central section, between Concord Road and the Main Northern railway line, is mixed commercial, single family detached dwelling residential, warehouse/office developments and community facilities. It includes: Rhodes Corporate Park, built on the site of the former Tullochs Phoenix Iron Works; two office blocks with some retail opposite the station; the Rhodes NSW Fire Brigades station (staffed by retained as opposed to full-time officers); single dwelling residences; the former Rhodes Public School (now a community centre); a Coptic Orthodox church and facilities; the Masonic Aged Care Hostel; warehouse/office development along the river; and the First Yaralla Sea Scouts. 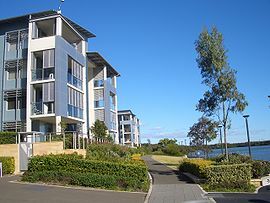 The western section, west of the railway line, features new developments on the former chemical and industrial sites, and includes: the Rhodes Waterside Shopping Centre; many new (2007) apartment blocks; and a public foreshore walkway with two small parks (one incomplete Jan 2010). This area was planned by the NSW Government under Sydney Regional Environment Plan No 29. Industry invaded the once picturesque and heavily forested isthmus in 1911 when Messrs. G & C. Hoskins established a large foundry specialising in the manufacture of cast iron pipes for gas and city water reticulation purposes. In 1930 their operations moved to Port Kembla, and in 1935 the site was taken over by CSR. During the period from about 1930 to the mid-1980s, the western part of the suburb between Homebush Bay and the railway line was taken up by chemical manufacturing. The main manufacturers were Berger Paints, CSR Chemicals, Union Carbide, and Allied Feeds. The former Tulloch Limited Phoenix Iron Works were located between the railway line and Concord Road, south of Mary Street. They gave their name to Tulloch Avenue and Phoenix Avenue. This is now the site of the Hewlett Packard offices in Sydney. Tullochs manufactured rolling stock for the New South Wales Government Railways. In October 2010, the City of Canada Bay approved a plan which would allow up to 5 buildings of 25 storeys in this Western section. The expected population in this western section is over 11,000, making it one of the most densely populated areas of Sydney outside the CBD. There are no facilities for organised active recreation or school education within this area. The remediation of the former Union Carbide site, the former Allied Feeds site and a strip of heavily dioxin contaminated sediments in Homebush Bay, have been the subject of extensive analysis, investigations and community activism, including by the Rhodes Peninsula Group. The remediation is approved and monitored by the Department of Planning & Environment with extensive community consultation. A strip of sediment in Homebush Bay between 40 and 100 metres wide and about 850 metres long along the eastern foreshore is being excavated and processed by direct thermal desorption and incineration to remove dioxins and other volatile organics. The remediation proposals were subject to a Parliamentary Inquiry by the NSW Standing Committee on State Development Committee. The remediation was completed in February 2011. Rhodes railway station is on the North Shore, Northern & Western Line of the Sydney Trains network. The station is about 30 minutes from the Sydney central business district by rail. State Transit provide services along Concord Road and Rider Boulevard. The Bennelong Bridge across Homebush Bay for buses, emergency services, cyclists and pedestrians opened in May 2016 from Gauthorpe Street in Rhodes to Footbridge Boulevarde in Wentworth Point. The bridge will affect access by boats into the southern part of the bay and its potential use for recreational sailing, although kayaking would be less affected except near the Rhodes shore. A number of Council and Roads & Maritime Services cycleways run through Rhodes, predominantly along Llewellyn and Walker Streets, joined by Leeds Street and an underpass under Ryde Bridge. There are shared paths along the Homebush Bay foreshore (incomplete in 2010) and immediately to the west of the railway behind the shopping centre and offices in Rider Boulevarde. Cycleways run west to Silverwater Bridge and on to Parramatta on both sides of the river. John Whitton Bridge, which is the former railway bridge joining Rhodes and Meadowbank, has a cycleway and pedestrian walkway. There are links to the cycleway running predominantly along the Cooks River to Botany Bay. A proposal to build Rhodes ferry wharf was announced in 2015. The wharf was scheduled to join Parramatta River ferry services but safety concerns resulted in the project being deferred in 2016. Rhodes features a mixture of single dwelling residential, high density residential, major retail developments such as Rhodes Waterside (including IKEA, Coles Supermarkets, Bing Lee, Reading Cinemas and a Target variety store), commercial, warehouse/office developments and community facilities. Rhodes has one of the last Fire & Rescue NSW stations staffed wholly by paid volunteers in inner metropolitan Sydney. It was established on land owned by the McIlwaine family, (for whom McIlwaine Park is named). Three generations of the McIlwaine family have been Captain of the Brigade. The fire station is located on Concord road near the intersection with Mary Street on the eastern side of the peninsula. Age distribution: Residents were younger than the country overall. Their median age was 29 years, compared to the national median of 38 years. The disparity is most marked for people aged in the range 20–29 years, which made up 38.3% of the residents of Rhodes, but only 13.8% nationally. Children aged under 15 years made up 10.9% of the population (national average is 18.7%) and people aged 65 years and over made up 3.7% of the population (national average is 15.8%). Ethnic diversity : 18.8% of people were born in Australia. The most common countries of birth were China 38.2%, South Korea 10.7%, India 4.4%, Hong Kong 2.7% and Saudi Arabia 1.7%. 18.4% of people only spoke English at home. Other languages spoken at home included Mandarin 36.8%, Korean 11.8%, Cantonese 8.1%, Arabic 3.2% and Hindi 2.5%. Finances: The median household weekly income was $1,693, compared to the national median of $1,438. This difference is also reflected in real estate, with the median mortgage payment being $2,200 per month, compared to the national median of $1,755. Housing: The great majority (94.6%) of occupied private dwellings were flats, units or apartments and 3.7% were separate houses. The average household size was 2.4 people. Religion: The most common religious affiliation was "No Religion" (50.6%); the next most common response was Catholic at 10.9%. The river is generally regarded as safe for secondary contact such as sailing. The river around Rhodes is used by rowing crews for training, predominantly in early mornings, late afternoons and on weekends. Sailing from Concord and Ryde Sailing Club can be seen in the distance from McIlwaine and Brays Bay Parks at Rhodes on Saturdays from 1 September to 30 April. Dragon boating is available from near Yaralla Sea Scouts near Ryde Bridge. There is a boat ramp at the northern end of Blaxland Road. There are other ramps at Wharf Road, West Meadowbank and on the eastern side of Silverwater Bridge on the southern side of the river. Fishing is banned in all of Homebush Bay (including from Rhodes and Wentworth Point). The Rhodes community is protected by the Rhodes, Concord and Ryde Fire Brigades. Rhodes Fire Brigade is one of only three remaining Retained (paid volunteer) Fire Brigades in inner Sydney. Rhodes Fire Brigade celebrated its 90th anniversary in 2011. In 2016, the City of Canada Bay Council had trouble with the influx of Pokémon Go players to the suburb, causing noise and disruption to the local residents. Lobbying from the Council has ceased the game in certain areas of Rhodes. ^ a b Australian Bureau of Statistics (27 June 2017). "Rhodes (State Suburb)". 2016 Census QuickStats. Retrieved 9 October 2017. ^ "Homebush Bay Bridge". Consortium of Wentworth Point Property Owners. Retrieved 2010-12-18. ^ a b "Sydney Regional Environmental Plan No 29—Rhodes Peninsula". NSW Department of Planning. 27 July 2007. Retrieved 2009-03-31. ^ a b "Key development areas - Renewing Rhodes". NSW Department of Planning. Retrieved 2009-03-31. ^ a b c "Redevelopment and Remediation of the Rhodes Peninsula" (PDF). 25 June 2002. p. 156. Retrieved 2009-03-31. ^ "Final Report, Redevelopment and Remediation of the Rhodes Peninsula". NSW Parliament. 27 June 2002. Retrieved 2009-03-31. ^ "Remediation Milestones and current situation - City of Canada Bay Council". www.canadabay.nsw.gov.au. Retrieved 2016-02-27. ^ "Meadowbank Rail Bridge over Parramatta River". New South Wales State Heritage Register. Office of Environment and Heritage. H01189. Retrieved 18 May 2018. ^ "Rhodes Railway Station (Waiting Shed)". New South Wales State Heritage Register. Office of Environment and Heritage. H01235. Retrieved 18 May 2018. ^ "Getting on with the job: three wharf upgrades and a new wharf for Rhodes". Transport for NSW. 16 April 2015. ^ NSW, Roads and Maritime Services,. "Rhodes new ferry wharf and interchange". Roads and Maritime Services. Retrieved 2016-02-27. ^ "Rhodes Fire Station". Canada Bay Connections. Retrieved 2016-02-27. ^ "'Rhodes no longer officially exists'". Retrieved 2016-08-05.